In the nonprofit world, peer-to-peer fundraising, a specific form of crowdfunding, has become increasingly prevalent. The terms are often thrown around interchangeably, although they’re two different approaches to raising money. You’ve probably heard about crowdfunding. Well, Peer-to-peer fundraising is a specific type of crowdfunding! Peer-to-peer fundraising is a multi-tiered approach to crowdfunding. 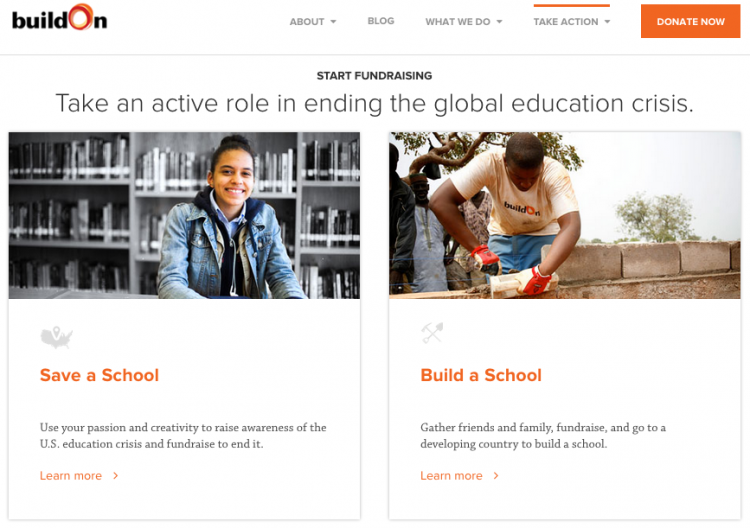 This means individuals can create personal fundraising pages for your cause’s behalf. This can feed revenue back to your organization as a whole, or to a specific campaign you’re running. Either way, the individual shares his or her page with friends, family and community members for donations (hence “peer-to-peer”). Now, let’s dive into the specific elements that make peer-to-peer fundraising unique! Peer-to-peer fundraising is “multi-tier,” so an organization can empower its donors to create personal fundraising pages and raise money on its behalf. This ability to draw on your network’s network can increase donations and allow you to reach new pools of donors that might have been inaccessible otherwise. The average fundraiser raises $568 from 7 donors – 4 of whom will be new to your organization! Rather than banking on instant mass appeal, peer-to-peer fundraising campaigns build momentum by engaging and activating fundraisers, who then reach out to their own networks for support. That being said, you can increase your overall chances of success by first appealing to a core group of supporters and evangelists who can start fundraising, create initial momentum, and build social proof for your campaign or cause. Fundraisers have high personal buy-in: One of the main components of peer-to-peer is the ability it gives fundraisers to individualize the cause and explain why it matters to them. Supporters can connect their own beliefs, values, and identity to your mission, and their personal fundraising pages become a vehicle for them to express their story in their own words. As a result, supporters are more self-assured in their involvement and are willing to share their message, as it relates to yours, with other people. This individual investment in your cause can lead to high fundraising goals and a personal desire to see your campaign succeed. Peer-to-peer campaigns also increase trust between your organization and new potential supporters, as they learn about your cause through a friend’s page. People are more likely to donate to a cause their friend or family feels strongly about, so allowing others to fundraise for you can be an amazing way to grow your supporter base. Provide resources for fundraisers: Although your fundraisers are doing the asking, this doesn’t mean you can sit back and expect donations to roll in. Peer-to-peer presents a unique opportunity to have your supporter base help rally their networks around your cause. Your individual supporters ask their friends and family to donate to their personal fundraising page, allowing you to leverage the preexisting trust between the asker and asked to increase the credibility of your appeal. However, this also means your success relies directly on your fundraisers’ results. You must provide the tools and education your fundraisers need for their personal success. With peer-to-peer fundraising, you’ll want to reach out to your fundraisers, proactively offer resources and instruction, and help them develop an individualized strategy for success. Rolling, or year-round campaigns revolve around your supporters’ life events. Whether it’s a birthday, holiday, wedding, or athletic endeavor, (or just because!) supporters can use any occasion as an opportunity to fundraise for your organization. By implementing this option as a permanent fixture on your website, you enable your fundraising community to take action on behalf of your organization outside of your hosted campaigns or events. Time-based campaigns, on the other hand, take place within a specific timeframe, generally 6-8 weeks. They’re usually fixed around a specific theme or activity, such as a holiday campaign or one that supports a certain program. Because you have a limited timeframe to reach a specific fundraising goal, this campaign type requires a proactive marketing strategy to spread the word and rally support around your campaign. To get supporters even more excited about a campaign, you can encourage them to fundraise as a team. Each team member makes their personal page, but the results are also logged on a team page. This can be a particularly fund idea for a Run/Walk or holiday fundraiser. Encouraging a little competitive edge can help individual fundraisers conquer their fears about asking for donations! Combined registration/fundraising: You can implement peer-to-peer fundraising in your event, like a race or gala, by setting up combined registration and fundraising. In addition to (or instead of) a registration fee, you can ask participants to create a fundraising page and raise a certain amount to gain entrance into the event. They can drum up support or get other people excited about attending by fundraising in the weeks before your event. You work hard to establish your organization’s brand. Brand recognition establishes and maintains trust with your supporters. With the right peer-to-peer fundraising platform, you can (and should) establish your organization’s branding across your campaign and fundraising pages. 1. Peer-to-peer fundraising is just another form of crowdfunding. 3. Peer-to-peer fundraising is a great way to allow supporters to own your cause and raise money for you in place of a life event, like a birthday or graduation. 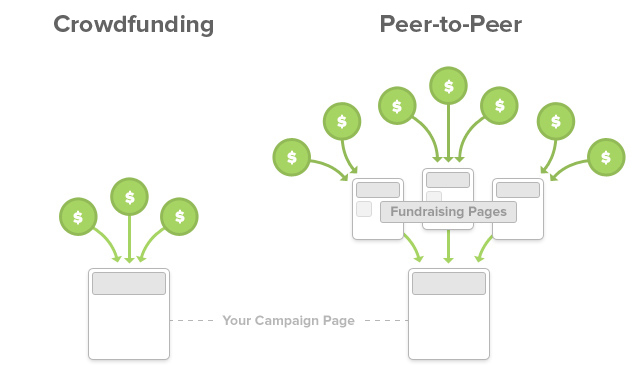 There you have it – a high-level overview of peer-to-peer fundraising. As you can tell, the options to get creative with peer-to-peer campaigns are nearly endless. Whether you decide to allow supporters to fundraise for your cause year-round, or to amplify your efforts around a specific campaign, peer-to-peer fundraising can really brighten engagement and revenue for your cause! Read Next: More Resources on Peer-to-Peer Fundraising!